… Let me know what you think. 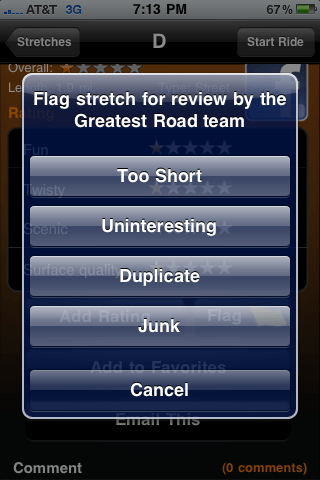 Greatest Road is a social iPhone application for motorcyclists. It connects bikers so you can find the best roads to ride. Want to find a new place to ride this weekend? Going on a road trip? Visiting other parts of the country or world? 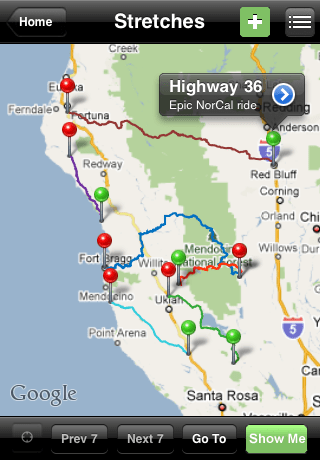 Pop open this app, pick an area near you or where you’re headed, and see a bunch of great roads right on the map. All of these roads have been added by other riders. Tap on any stretch to find out more. Show off your latest conquest. Tell buddies where to go. 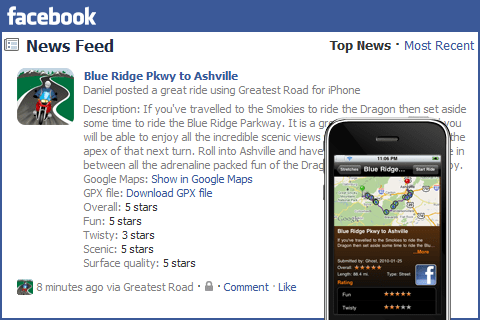 With one click, post your ride to your Facebook wall. From there, you or your buddies can see the ride on top of Google Maps. 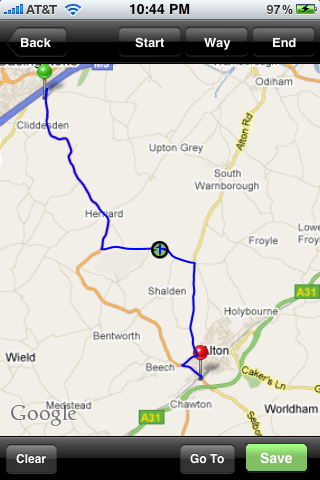 Found a ride that someone entered by mistake? Found a ride that’s too short, or even a duplicate? Tap the flag button and we’ll be on it like hot rubber on summertime asphalt. 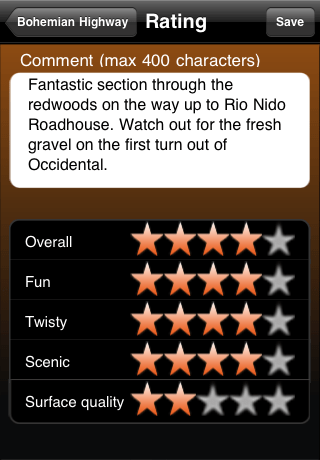 See how other riders have rated a stretch overall and in terms of fun, twistiness, scenery and road surface. Look at a view of the stretch and see its length and surface type. Tap the map to zoom in on the stretch full screen. Read Comments to find out about the road or discover timely hazards. 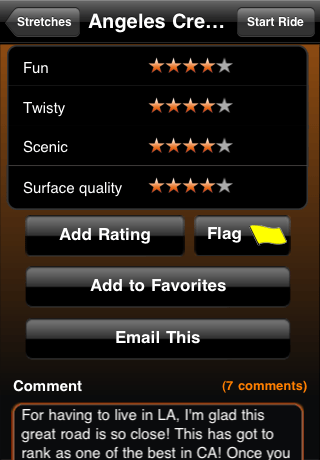 Add your own Ratings or Comments. 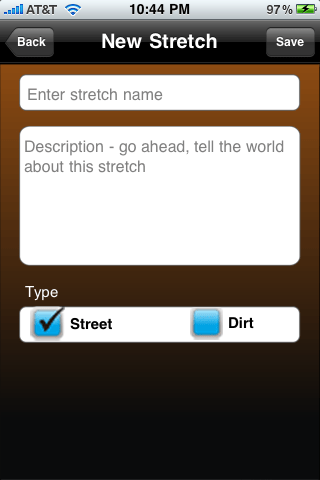 Tap Share to email the stretch to friends with iPhones OR with standalone GPSes via GPX file download. Flip between Map view and List view for browsing interesting road stretches. Tell others how great the road is, let them know about the places to stop along the way, or warn about road hazards you saw the last time you were up there. What goes around comes around. 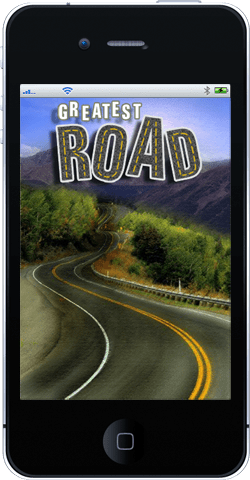 Add new roads into the collection for other bikers to see and ride. Tap the green + to get started, then drop a start and end point. We take care of the routing. Don’t like the path we picked? Add way points to get people going the right way. Once you’ve pointed out the directions, you get to name it and add your own description of what’s worth seeing along the way. On a dual sport bike? Mark roads as only suitable for dirt-capable machines.